JAMMU, Nov 10: TR Technology Solutions, a web and software development company was launched here today by the founder and CEO of the Company, Tahir Rufayee. The Company will have a team of professionals from the top colleges of the India including IITs and NITs for the purpose of web and software development. The website of the company www.trtechnologysolutions.com was also launched today. Speaking on the occasion, Rufayee said, I’m extremely happy that today we have done our official launch and entry in the Jammu. 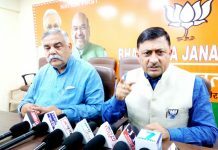 We will be doing every possible effort for digitizing the state of J&K”. Others who were present on the launching function include Dr Mubashar Mir, Preeti Kashyap, Waqar Wani, Akash Manhas, Momin Aslam and Gursimran Singh.